Dr Ali joined the Board of Funding Neuro at the end of 2016 and is helping to take forward the exciting plans for the charity. Dr Ali is currently in the process of establishing medical and scientific sub-comittees. 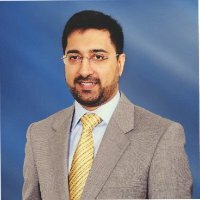 He is the Head of Middle East and Asia-Pacific Regions for the Institute for Healthcare Improvement (IHI), he is also a Consultant in Family Medicine and has more than 15 years of clinical experience. Prior to joining IHI, he spent five years at the Abu Dhabi Health Services Co. (SEHA) in Abu Dhabi (UAE), initially as the Director of Clinical Affairs and Quality, Ambulatory Healthcare Services, and then as the Group Quality and Physician Services Director. Previously, Dr. Ali served as a Clinical Director of Primary Care in Lanarkshire, Scotland, and was a GP Principal and partner at Strathaven Health Centre in Lanarkshire. He was also National Clinical Lead for the Royal College of General Practitioners Scotland’s flagship program, Living Better, and served as Co-Chair/Primary Care Lead for the Respiratory Managed Clinical Network in NHS Lanarkshire. Dr. Ali is a graduate of the University of Glasgow and Imperial College, London, and he holds an MBA (with distinction) from the University of Strathclyde. Dr. Ali is a member of distinguished medical societies, including the Royal College of General Practitioners (UK). He is a member of the Faculty of Medical Leadership and Management (UK) and an alumnus of the INSEAD Middle East Health Leadership Programme.